Richard Ware is a RYT200 working on his 500RYT with Yoga 4 Love. He an outdoorsman and an ex Army Airborne Ranger with over 160 jumps. His style of teaching is witty and strong. His classes focus on the stretch and alignment in a non-competitive environment. His teaching style is alignment based for all levels, all ages, vintage students, and beginners. His classes are very relaxing. 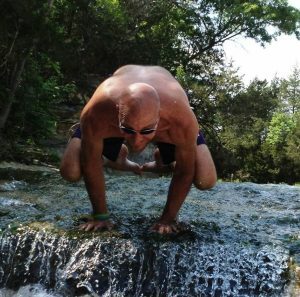 In 2011 he made the change from intermittent yoga practitioner to Yoga Teacher and took his practice to another level. By deepening his personal practice on the mat he developed a growing desire to share the benefits of his transformation with others through teaching yoga. He began to see a need to begin a series for all levels, so he got his yoga teaching training and jumped on board. He loves to enrich others lives sharing the physical changes he has seen in his own body, and more significantly, the mind, body, spirit connection of a healthy and strong yoga practice. Come to one of Rich’s classes, you will find yourself immersed in breath and flow, while gaining core strength and mastering inversions. He moved into training for Thai Yoga Therapeutic Massage. He says is like a doing a yoga sequence without doing anything! He loves helping people relax in a way that releases tension, fatigue and stress. Richard is currently is owner of The Fish Physician, aquarium maintenance, design and installation, founded in 1996. When he is not designing and maintaining aquariums for people you will find him on his yoga mat, practicing hot yoga, enjoying his quiet time on their land, and doing outdoor projects with bees, their dogs, cats horses and especially his chickens. Rich is married to his lovely wife, Lisa. They have two wonderful kids and have been married since 1992. He also enjoys teaching Acro + Partner Yoga, Tree Yoga and Thai Bodywork. Richard has been practicing yoga for 9 years. He currently is owner of The Fish Physician, aquarium maintenance, design and installation, founded in 1996. When he is not designing and maintaining aquariums for people you will find him on his yoga mat, practicing hot yoga. He enjoys his quiet time on their land, outdoor projects, bees, their dogs, cats horses and especially his chickens. Rich is the husband of Lisa Ware, and co-owner of the studio. They have two wonderful kids and have been married since 1992. He loves to enrich others lives sharing the physical changes he has seen in his own body, and more significantly, the mind/ body /spirit connection of a healthy and strong yoga practice. Come to one of Rich’s classes, you will find yourself immersed in breath and flow, while gaining core strength and mastering inversions. Book a Thai massage and you will find yourself immersed in breath and flow, or take one if his classes to gain core strength and master inversions.